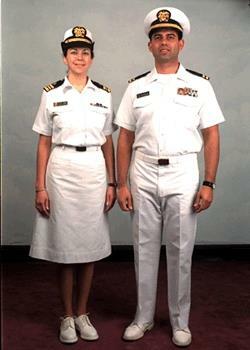 Along with the National Oceanic and Atmospheric Administration Commissioned Officer Corps, the Public Health Service Commissioned Corps is one of two uniformed services that only consist of commissioned officers and has no enlisted or warrant officer ranks, although warrant officers have been authorized for use within the service. Officers of the PHS are classified as noncombatants, unless directed to serve as part of the armed forces by the President or detailed to a service branch of the armed forces. 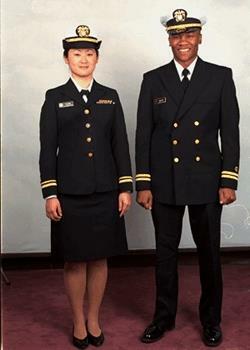 Members of the PHSCC wear the same uniforms as the United States Navy and the United States Coast Guard (when assigned to the Coast Guard) with special corps insignia, and hold ranks equivalent to those of naval officers. Officers of the PHSCC receive their commissions through the PHSCC's direct commissioning program. Dr. fouled anchor and caduceus. 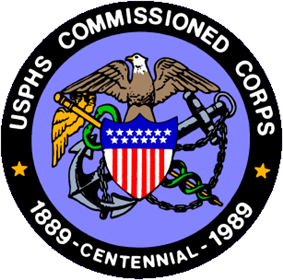 Later that year of 1889, President Grover Cleveland signed an Act into law that formally established the modern Public Health Service Commissioned Corps (then the Marine Hospital Service under the Supervising Surgeon (later Surgeon General)). At first open only to physicians, over the course of the twentieth century, the Corps expanded to include dentists, engineers, pharmacists, nurses, environmental health specialists, scientists, and other health professionals. Today, the PHSCC is under the United States Public Health Service (PHS), a major agency now of the United States Department of Health and Human Services, (HHS)), established by Congress in 1979-1980. It was previously established in 1953 as the United States Department of Health, Education and Welfare, (HEW) and is still led by the Surgeon General. The PHSCC allocate officers to all seven uniformed services depending on the health and/or medical needs of the other uniformed services. 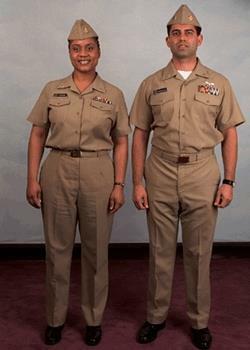 The Corps also recently initiated a transformation to enlarge the size of the Corps. The Commissioned Corps is also often called upon by other federal, state, and local agencies to aid and augment in times when their resources are overwhelmed. These responses are considered deployments, and may be for technical needs in standard settings, or in the event of disasters, in austere environments. The corps is often deployed as part of FEMA Emergency Support Function #8 in the national emergency response plan, but can also be deployed on an individual basis for various needs to other federal agencies, states, local governments, or even to aid foreign governments. Like all other federal-level responses, officers are deployed only upon request, and upon the recommendation of the Surgeon General and permission of the Assistant Secretary for Health. During deployments, officers may report to regular office spaces, such as coordinating responses at state-of-the-art emergency operations centers, or into the field in extremely austere environments, such as when responding to a natural disaster. In addition, deployments may either be on an individual basis, such as when specific skill sets are needed, or as part of a team, when large-scale responses are needed. The corps, as a uniformed service, may also be militarized and considered a branch of the armed forces by an act of Congress, or by executive order by the President of the United States, not only in time of war, but also in "an emergency involving the national defense proclaimed by the President." One such major militarization of the corps occurred during World War II, in which the corps was militarized for WWII and the Korean War. ^ a b "U.S. Public Health Service Commissioned Corps". U.S. Department of Health and Human Services. Retrieved 24 June 2008. ^ "HHS Promotion Letter". Retrieved 5 November 2012.